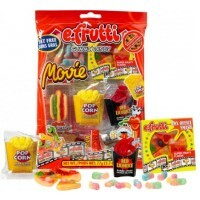 Satiate your sweet tooth with a bag of E-frutti Gummi Movie Candy! 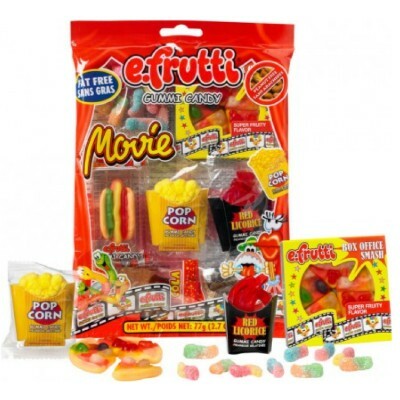 Featuring an assorted selection of these famously sweet and sour treats, E-frutti Gummis come in eye-catching shapes that will always keep you guessing! If you’re looking for the perfect way to kick up movie night another notch, let E-Gummis take it from ordinary to extraordinary! Glucose syrup, sugar, gelatin, acidity regulator E330, pectin, artificial flavors, colors E129*-E150-E102*-E133-E110*-E171-E100ii, palm oil, glazing agent E903, salt, caramel, acidity regulators E270-E333. *May have an adverse effect on activity and attention in children. Contains GMO. Nutrition facts (for 100g): calories 333Kcal, total fat 0g (saturated fat 0g), total carbohydrate 78.8g (sugar 54.5g), protein 0g, salt 0.2g. J'ai adoré, surtout la pizza et le popcorn. Le bonbon pop corn a vraiment un doux goût de popcorn.